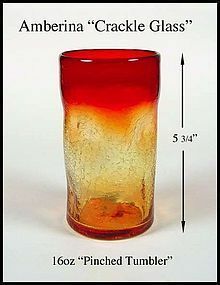 This Amberina Crackle Glass 16 oz large pinch tumbler is in excellent condition. It has a ground pontil on the bottom and 4 "pinch" indents in the sides. The size is on the photo. 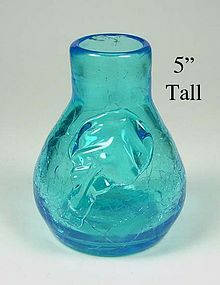 It was probably made by The Pilgrim Glass Co. and is very attractive! We bought this from an estate where everything in glass was Blenko. The family said it was bought from a dealer that declared it was Blenko, so we assume it is. Very nice 5 inch vase with crackles with a bottom pontil.